June 26, 2001 - This last week was amazing. We made our sponsor announcement on the Today Show on June 18th. We had our graduation that night and the next morning we had a satellite media tour where we did 30 straight interviews in 5 hours on tv morning shows across the country. We were also featured in USA Today and many more. We had 50 Million Impressions in the first 48 hours of our announcement! It was a lot of fun but hard work and a couple days of no sleep. The interviews keep coming in and we keep doing them. We are having a great time. First USA is the best possible company we could have picked, we love the company and we truly believe in getting college students to understand the importance of financial responsibility. There is a lot in store over the next few weeks. Chris on Sunday is going out to California for orientation at Pepperdine University and Luke is taking a short break going down to Virginia to be with some of his family. It's been a great time and keep your eye open for us, you'll never know where we pop up! We are preparing for our high school graduation, prom, and our big sponsor announcement on or around June 18th! We are very excited about the sponsor. We had spoken to over 15 companies who approached us this year, we narrowed that list down to a company whom we feel we can work the best with. Last week we filmed with Canal Plus, which is the HBO of France. It was a lot of fun. We can't wait to hear our voice's dubbed in French! Many TV and Radio shows are calling but we are holding them off until the BIG ANNOUNCEMENT! We have worked really hard this year in school meeting with sponsors, doing media appearences. It has been a wonderful experience for both of us. We have met so many wonderful interesting people and received many emails from around the world. We are looking forward to a really exciting summer and freshman year at college! We hope to be the best spokesguys our sponsors ever had! So much has been going on this last month! We have been busier than ever. We were featured in the June 2001 issue of Teen Magazine! We are on page 98 so everyone go out and buy a copy! We have been getting tons of emails from girls around the country. We read every email and try to write back to as many as we can so keep on sending them. Television from around the world, from France, to English, to Japanese TV will be coming out over the next few weeks to do segments on us. I (Chris) was out at DECA nationals and it was so much fun! My partner and I both did very very well and met tons of great people! The due date for college tuition was on May 1st, both of us will be out in California. We both got into our top choice schools... we'll let you know which ones they are in a little bit so keep checking back. We are getting some great companies to join on with us. We will be making tons of major announcements over the next 4 - 6 weeks! This is a very exciting time for everyone so keep the emails coming to us, let us know what you think and if you have any cool ideas for us, we are all ears! March 30, 2001 - Our senior trip was a lot of fun! We got to do everything in Orlando from going to a luau to the Tower or Terror to Universal Island of Adventure! We had the best time! After our short break we came back and had a lot of work to catch up with. This week we had a lot of interviews, our favorite was on MyCityRadio. We had a photo shoot for Philadelphia Magazine. Our article should be out in the May issue. It should be really great! If you are in the area you should pick up your copy! This week we also met with a very large company. Everything looks like it is coming together very very well. Luke and I have both been finding out about colleges over the last couple weeks and they are coming back very positive! Announcements will be being made over the next month or two once we have finalized everything! We should be hearing back from some more TV shows this week to tell us when we are going to be making appearances so keep checking back so you can keep your eye out for us! We both took tons of pictures in Orlando, so I think if we can find some time this week we will be putting a lot of them up on the site so you can look at what we did while we were there! March 19, 2001 - This past week went pretty well! We did a bunch of interviews on the radio and for publications of all kind! Hundreds of emails of support from everyone who visited our website and read People Magazine. We were featured in the largest Norwegian Newspaper, on the MSN Israel website, and tons more! Today we went into Philadelphia to meet with the best magazine in Philadelphia... Philadelphia Magazine! We had a great time. Look for us in their May issue! We are going up to New York City to do some interviews. Wednesday at 5AM we have to be at school because we are leaving for our Senior Trip to Disney World! Should be a great trip. A couple TV shows are booking us for April, so we'll keep you updated on what's going on with all of that stuff! Talk to you after our trip! March 11, 2001 - The past couple weeks has been going by so fast. I'll do a quick update on whats been going on... Our People Magazine article was published in the March 19, 2001 issue. On the cover was Julia Roberts. Everyone go buy a copy and check it out its pretty cool. We are also in New Jersey Monthly (March issue) this month. Entrepreneur Magazine did an article on us in their April issue. We've been doing a lot of radio interviews. Luke and I are waiting for our college acceptance letters to come in so we can finally decide where will be ending up next year. We should know this in about a month. Luke and I have our senior trip to Disney World on the 21st. And I won at the State Competition of DECA in New Jersey, so I'll be going out to Anaheim with a couple friends from school for the Nationals on April 25th! We'll keep you up to date on everything else that is going on. February 19, 2001 - The past week or so has been really busy. We had out photo shoot with the best photographer in New York City - Rafael Fuchs. He was great! Then on Valentines day we were taken out to dinner by Sona from People Magazine in downtown Princeton. It was the best Valentines Day ever. Thanks Sona!! Our article should be out this Friday, so go check it out!! We did a ton of radio interviews this week. We'll start knowing about colleges in about a month or so. February 10, 2001 - Our USA Today article was published last Wednesday. That was pretty cool. We got a lot of exposure and tons of emails from that article! Yesterday we made an appearance at the television show Trackers on the Oxygen Network. That was so much fun being guests on the show! We have a photo shoot for People Magazine on Tuesday at Princeton University, that should be out in the next couple weeks. That's about it for now. Everything is going really well!! February 5, 2001 - Tons of interviews. We have been so busy! Keep an eye out for us in the newspaper USA Today, it will either tomorrow or next week! The USA Today TV show wants to try and do something with us the same day the article is published. We are going to be in the September issue of Cosmo Girl. Entrepreneur Magazine is getting ready to go to print with an article about us. New Jersey Monthly we'll be in the March issue. This Friday we will be appearing on the national teen show Trackers on the Oxygen Network. Radio interviews keep coming in. Still waiting to hear back from colleges, we'll know where we've been accepted to by April 1st! We'll let you know where we are going when we make up our minds! Thanks for all of the support and hope everyone's 2001 is going great! December 30, 2000 - We hope everyone had a great holiday week. Chris went up to Vermont and tried snowboarding for the first time and picked it up in about an hour. Luke went down to Maryland to visit some of his family. We both went to the Cooper Charity Ball last night at the Union League in Philadelphia. We had a great time there! The New York Post should be putting out something about us in an end of year story. We'll keep you updated on how that turns out. We wish everyone a safe New Years eve and a very successful 2001! December 17, 2000 - Hey Everyone! Sorry it has taken a long time to get an update on here. We have been busy submitting our college applications and talking with sponsors. We have been getting tons of email from our fans and other people. We went back up to Studio Y on the 5th with another client of our publicists... The Hip Hop Teenz from Miami. They were a lot of fun and very very good at dancing! Our website was The Wall Street Journal's Classroom Edition Site of the Day on December 1. We are also in the best websites for 2000 in Yahoo Internet Life magazine! We have a really good picure of Luke and I on page 109. It is in the January 2001 edition. Everyone go out and buy a copy. I'll try to get the page scanned and up on the site as soon as possible. So much has been going on lately it has been really fun. Tell all of your friends about what we are doing and keep sending us your email we read every letter, sometimes its hard to write back to all of them though. If there are any other companies still interested in sponsoring us feel free to send us an email and we will direct it to the right people! December 1, 2000 - We had a lot of fun this week. We were on the TV show Studio Y on the Metro channel in NYC area. We had a fun time doing the interview there the other guests on were Ruff Endz, and we went up with our friend from the band Imajin, Talib. We will be back up in NYC next week doing some more appearances. We had more interviews for a lot of newspapers, and radio. The latest being BBC Asia & we are in Adbusters. 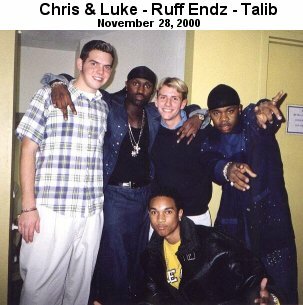 Here is a small picture of us in the green room with Talib and Ruff Endz. November 27, 2000 - This week has been very busy. We did a lot of interviews. Today we were on the BBC Radio 5 in England and on BBC.co.uk a big article on us was there. Tomorrow we are going up to New York City after school. The show Studio Y is having us on as their guests. This is going to be live TV so it should be a lot of fun! November 20, 2000 - CoolSiteOfTheDay.com today! Make sure you give us 9 or 10's when you vote so we can be CoolSiteOfTheMonth! We are moving forward with contracts and still filling out applications for college! Everyone should order Luke's CD and My manual they are very good and you'll learn a lot from them! Check out the link above this for more info! November 12, 2000 - This last month has been very busy. We have been doing interviews all around the country on the radio and other appearances. Yahoo Interview Life Magazine will be publishing an article on us in the next issue. They sent one of the best photographers from New York City down to our school for the photo shoot. We had a great time! Luke started a Job as a pizza guy working downtown. We have been looking at schools, we went up to New York City to look at NYU the other day and that seems to be a great school too! Luke is up in Boston this weekend looking at schools. We have also been meeting with a couple companies about sponsoring us. It is looking good. We hope to have our announcement in the next couple weeks. Keep checking back! Also on November 20, 2000 we are going to be CoolSiteOfTheDay on The original CoolSiteOfTheDay.com. Pretty exciting stuff going on! In the mean time check out our new "ChrisAndLuke.com Package." October 5, 2000 - We had our first real college interviews today, we talked with University of Southern California in Philadelphia. It seems like a great school and that we would fit in very well with the student body. Thanks Diana & USC! September 27 , 2000 - September 30, 2000 - We did about 15 more interviews and we were ZDNET / Yahoo Internet Life Website of the Day! Thanks for all of your support! September 15, 2000 to September 26, 2000 - Our FoxNews.com interview was published, we were on ABC News in Philadelphia and was released to their affiliates around the country. We have been waking up at 6AM every morning to do radio interviews, then we have to go to school then do more interviews after school! We have been meeting with possible sponsors and we are constantly being contacted by more and more companies. September 14, 2000 - WNBC 4 Interview Airs, We traveled up to NYC for the morning to be on the Jay Thomas Morning Show on Jammin 105 "New York's Jammin Oldies" and then we went over to FoxNews.com and they did a 30 minute interview with us for their website. Also getting close to the 500,000 hits on our site! September 7, 2000 to September 13, 2000 - We did about 30 interviews... Radio and TV including WNBC 4 in NYC. September 6, 2000 - Fox News TV Interview, Philadelphia Inquirer Interview & Bloomberg Radio! September 5, 2000 - Associated Press Article Released, WCBS Interview & 810 KGO/ABC News Radio! September 4, 2000 - 1010 WINS Interview! 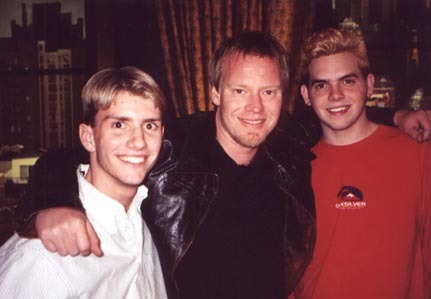 September 3, 2000 - 330,000 Hits on ChrisAndLuke.com! September 2, 2000 - ChrisAndLuke.com is Yahoo.com Website of the Day (Again)! September 1, 2000 - Philadelphia Inquirer & CBS TV News Interview! August 31, 2000 - Colonize.com Website of the Day! August 30, 2000 - Radio Interviews in New York City! August 29, 2000 - Interview with Associated Press & many others! August 28, 2000 - ChrisAndLuke.com is Yahoo.com Website of the Day!